Alex Tardy, NWS San Diego, posted the above image to the Albany MAP list a bit ago. I have grabbed it, since it is relevant to the post below. The top panel is GFS predicted 250 mb wind speeds for 00Z October 6th (next Wednesday at 5 pm MST). The bottom panel is from the ECMWF valid at the same time, also for 250 mb winds. The difference between the two forecasts is quite striking. The ECMWF jetstream down the back of the trough is much stronger than that forecast by the GFS. Further, the GFS has strong winds already coming around the bottom of the trough, in contrast to the ECMWF. Thus, it is not surprising that the ECMWF is currently forecasting a slower, and deeper system than is the GFS. Time will tell which model has better forecast the evolution of this system - perhaps the first significant winter-type event of the Fall season. A sign that the season has changed by way of the very large difference bwteen the ECMWF forecasts versus the GFS at end of next week. The ECMWF 500 mb forecast valid at 168-hours is shown below. Minimum heights over western Arizona are lower than 5580 m.
As has been the case last couple of winters for most strong systems, the GFS is considerably weaker with its forecast. The GFS is also about 12-hours faster than the ECMWF - so I'm comaring the 156-hour GFS with the 168-hour ECMWF - not quite legit but GFS has its lowest heights then. Note that there is a large area of the Southwest with ECMWF 500 mb heights 100 m to almost 200 m lower than those forecast by the GFS. Snow possible in Flagstaff with this system, or mostly strong, chilly winds? At sunrise this morning there was somewhat chaotic clouidness around (above is 8 am MST view of Catalinas from campus). Most interesting at sunrise were substantial lenticular clouds streaming off to the west from the Catalinas and Rincons. These were unusual in that there was some convective development on their tops and mammatus formed on their west ends. While I walked along the Rillito I noticed distinct pockets of warm and cool air - probably related to where the wind had mixed down to the ground recently. By 7 am MST east winds had really broken through and it was quite warm - 73F here (about 15F warmer than yesterday morning) and 77F at TUS (12F warmer than same time yesterday). The east winds are now at least 25 to 30 mph based on a large wind chime that I have roughly calibrated. The east winds behind the backdoor front are quite strong, as per the morning Tucson sounding - below from SPC. The sounding indicates east-southeast winds of 25 to 30 kts from 500 mb to the surface, so there's substantial downsloping underway. 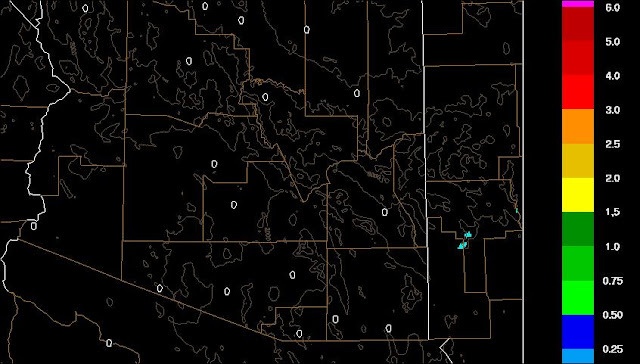 The SPC diagnostics indicate little CAPE, and PW values are mostly below an inch across southern Arizona. The early run of WRF-GFS at Atmo indicates another supressed day over southeast Arizona (there were isolated thunderstorms yesterday but no reports of measurable rainfall - there were a couple of nice lightning flashes off north of the Catalinas just after dark). The WRF-GFS predicted rainfall through midnight tonight is shown above - WRF-GFS keeps storms and rainfall mostly in the north half of state - although a couple of isolated storms develop right along the border and south in Mexico. The current morning NAM forecast tends to keep storms and precipitation over the west half of state - both models agree that little happens today locally, except for strong east winds. Just Looked Off To The Northeast! 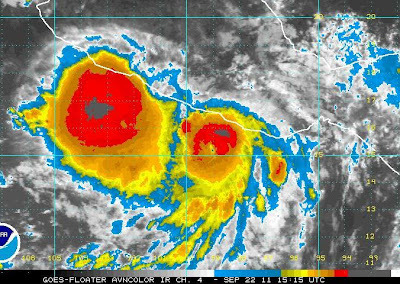 First - Hilary has weakened rapidly and become a remnant low already this morning - far off to the west of lower Baja (and far off the early predicted tracks, with latest NHC forecast below). It appears that the middle and higher level moisture is initially heading east toward Mexico. However, low-level moisture to the north and east of Hilary is pushing northward - that which comes up the GoC will likely move mainly up the Colorado River Basin, while the best push actually moves north up the west coast. That said, let's look off to the northeast this morning. Below is the 1500 UTC surface plot from the CoD weather pages. There is a strong cold front pushing rapidly down the Front Range of the Rockies. This front currently extends from Wisconsin, southwestward into the Texas Panhandle and northeastern New Mexico, and then back up the Front Range and westward across southern Wyoming. The front is heading south as the long stagnant, large 500 mb cutoff over the Great Lakes finally pulls off to the east and northeast. The 1500 UTC visible image above (also from CoD) shows there is some cloudiness along and behind the front. There is also a large arc of cloudiness from northeastern Mexico, across the Big Bend and westward to northern Sonora. The NAM forecast from this morning's run for 850 mb (below - valid at 1200 UTC tomorrow morning) indicates that the cold front will have pushed westward across southeastern Arizona by Friday morning. The early run of the Atmo WRF-GFS (which did quite well again yesterday) indicates little in the way of storms today; however, the model forecasts increasing activity tomorrow and Saturday. When I ran loops of the model forecast 700 mb RH, I was puzzeled at first by the strong increases forecast to come into Arizona from the southeast. However, it appears that moisture increases for the weekend will be strongly influenced by the backdoor front and moisture from northern Mexico. Hilary may still have some role in the weekend weather, but not at all like appeared possible a couple of days ago. So it goes! Some may remember that an outbreak of tornadoes occurred during the early morning hours of 6 October 2010 near Flagstaff. So, Flagstaff (soundings actually at Belmont) may have the two highest elevation, tornado proximity soundings ever taken, and these within a period of less than a year. A quick summary this morning. 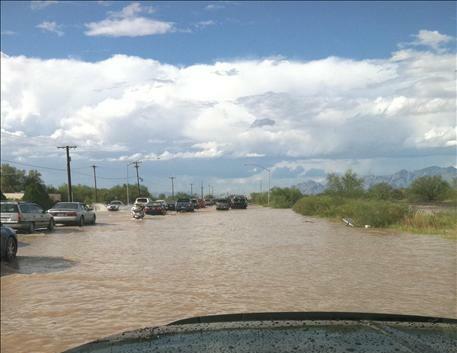 Storms moved across parts of the Tucson metro area yesterday afternoon from around 2:00 to 4:30 pm. Above is view north from campus at 3 pm MST and below is regional radar at 3 pm from NCAR. There were strong winds at spots and some hail reports - quite something given the mediocre morning sounding yesterday. The WRF models did a quite good job of forecasting the event. Here at the house we had a very nasty lightning storm, with wind and dust and little rain. This was followed by a second cell that devloped just to the east with heavy rains and more gusty winds. I estimate 40 to 50+ mph several different times, and I was worried about some of our trees. By the time it ended here we'd had 0.66" of rain. I drove off to Campbell and Glenn on an errand after the storms had moved to the west, and there was signifcant flooding running very deeply down several of the streets in this part of town, and I had to detour several times to get where I was going. The ALERT network data shows that 44 of 93 sites had rain in past 24-hours. Seven sites had more than half an inch and Mt. Lemmon reported 1.26" - so a stronger event than anticipated yesterday. Things of note this morning: large and somewhat amorphous middle and upper-level low is centered over Sonora; Very cool middle level temperatures remain in place at 500 mb along the Borderlands with -12C common; Sounding has less PW this morning and very little CAPE - plus there has been substantial near-surface cooling (upper 50s F this morning here at house). So, I expect a much less active day. The early Atmo WRF-GFS forecasts some storms this afternoon, but keeps them totally confined to Santa Cruz County. Finally, this morning's forecasts for Hilary have shifted substantially to the west, so that it remains very unclear what her evential impacts in the West might be. Thunderstorm and light shower activity increased some yesterday, and there are early morning showers to the east in Cochise County (see 8 am MST visible image above). The early run of Atmo's WRF-GFS model picked this up nicely. The increased shower activity has recycled some moisture into our deep boundary layer, and the 500 mb cutoff that is over southwest Arizona and northwest Sonora has help pull some middle level moisture northward across the border. Interestingly, this morning PW is higher across southern Arizona than it is at Hermosilla, Mexico. The 500 mb cutoff is digging to the southwest and will sit off of northern Baja for the next two days, before perhaps heading back across the Southwest as a weak, open short wave. The GPS time-series of PW (above, with TWC raob values plotted) shows the nice increase here at U of A, with PW nearly doubling from noon to midnight yesterday. 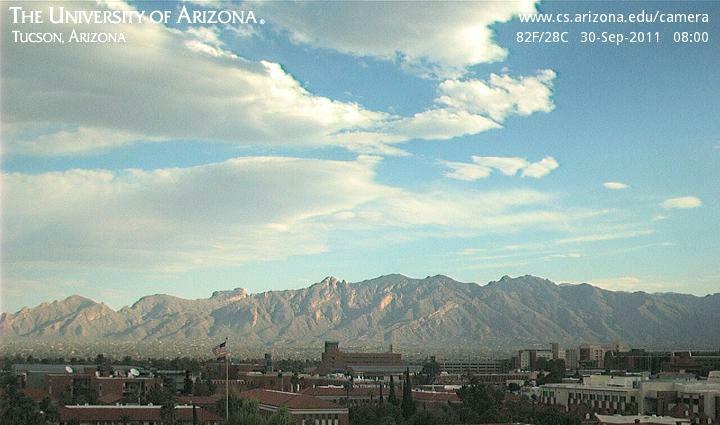 Values are now over an inch across southern Arizona - in contrast, Hermosilla is at about 0.75". This morning's Tucson sounding (above from SPC) has a small amount of CAPE today - a more supportive sounding for storms wrt the last two mornings (note that there were isolated storms the last two days even with the very marginal soundings). The temperature this morning at 500 mb is a very cool -12C, which will help things along. 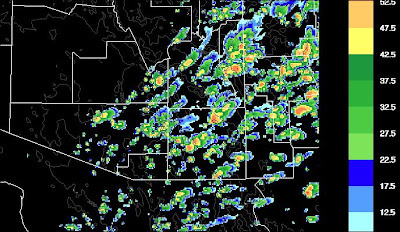 Below is the WRF-GFS forecast of composite radar echoes at 4 pm MST this afternoon, with storms forecast for eastern Pima County. The 3 pm forecast sounding for Tucson indicates a small amount of CAPE above cloud bases at about 620 mb, where the temperature at cloud base is 0C. This is an excellent sounding for dry microbursts or downbursts. So we'll probably see an increase in gusty storms this afternoon. Finally, Cat. 3 Hurricane Hilary continues on her westward course - usually a storm with her history would be headed out to sea. However, the models and NHC continue to forecast an abrupt turn to the north to occur by tomorrow morning. We will continue to watch how she behaves. First - there were some light showers around yesterday afternoon and also on Saturday afternoon. Yesterday at 1912 UTC (1212 pm MST) the airport recorded a wind shift with a gust to 40 kts. This was followed by a brief shower and 0.03" of rain. I checked the KEMX radar loop, and indeed a tiny echo developed and moved right across the airport during its brief life. The second "singular" event at the airport this month. The FAA folks apparently should have taken a special observation around 1912, but that seems to have fallen through the cracks. Now to the interesting Hurricane Hilary situation. Above is an IR image fom 1130 UTC this morning, showing Hilary well west of 110 degrees W but only at about 17 degrees north. So, the Hurricane (still at Cat. 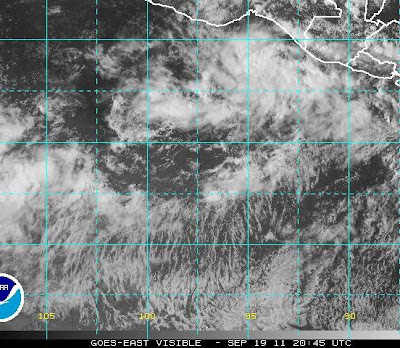 3) has stayed well south of the critical region, as it crossed west across 110, off Baja where tropical storms almost always trigger GoC moisture surges. While PW has increased over the far southern end of the GoC, this morning's upper-air charts show nothing related to Hilary that would trigger a surge at this time. The NHC forecast for Hilary (below) indicates a rapid northward turn after Thursday morning however - this forecast track eventually takes Hilary quite close to Baja, as it moves north and weakens rapidly. Thus, the question of interest is whether or not Hilary will actually trigger a GoC surge later this week? The NWS forecast models are seriously different this morning. Above is the GFS 84-hour, 700 mb forecast valid at 5 pm next Thursday afternoon. The GFS indicates that Hilary would have brought strong southerly winds into the lower GoC by this time. However, the NAM (below) forecast for 700 mb at the same time indicates Hilary as a weak remnant, but with a strong southerly flow all the way up the Pacific coast. Obviously, at this time, NHC is going with the global model. If the GFS comes close to verifying, we'd expect a GoC surge by Friday morning. The 500 mb short wave (see WV image above for 1400 UTC) that has been malingering off the California coast for several days is being pushed ashore by a stronger wave off the Washington/Oregon coasts. Models predict that troughiness will remain over the Southwest for next several days. The visible satellite image (below) or 1500 UTC shows two cloud bands over Arizona - one to the west with the trough and one to the east that is being pulled up from western Sonora. 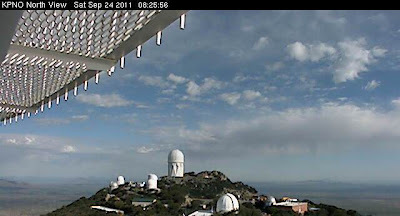 These are mostly shallow altocumulus but they are icing out with the cold middle-level temperatures and producing virga (see north view from Kitt Peak below). Models predict showers, and perhaps an isolated thundershower, over south-central Arizona off and on through sunrise tomorrow. This would be an interesting situation if the lower half of troposphere wasn't so dry. So, given the low PW values that are present well south into Mexico, perhaps we'll see some sprinkles and dusty outflows this afternoon. Note that Hilary (see WV image at top) remains a Cat. 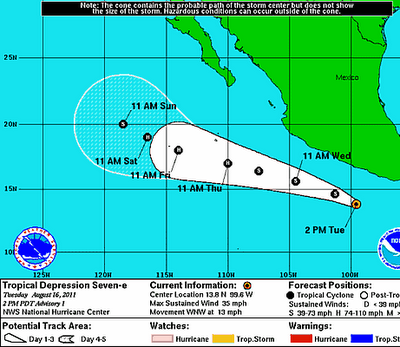 4 hurricane this morning and models indicate a wandering course that may eventually take her remnants toward Baja. 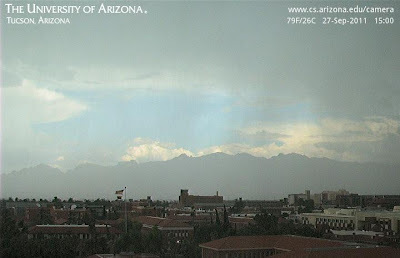 Yesterday was interesting in that there were many, short, stubby Cbs drifting around, some with virga as per above in view from Computer Sciences webcam. However, some of these eventually managed to grow deep enough to produce thunder and a bit of rain, along with some gusty winds. Several of the southeast Arizona reporting stations carried thunderstorm in the vicinity, and Nogales had thunder with 0.13" of rain. The Rincon RAWS reported 0.27" for yesterday afternoon. This morning dawned cool and dry, and the Tucson sounding (above from SPC) shows that the middle-level CAPE of the last two days has vanished. This in spite of the fact that middle-level temperatures remain quite cool. 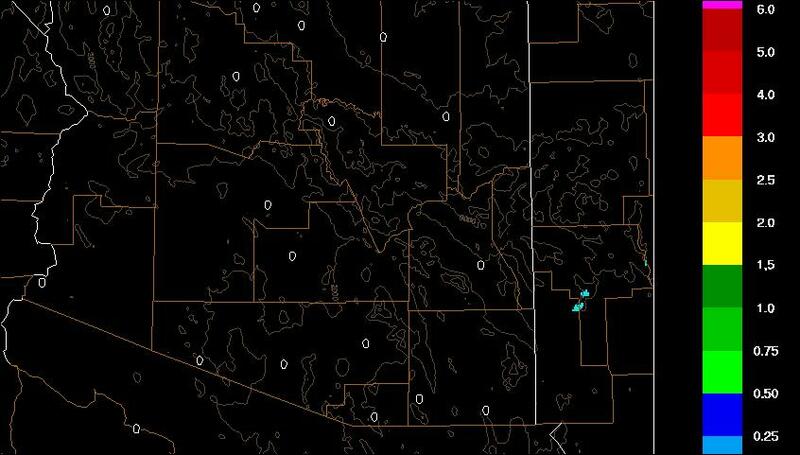 The Atmo early forecast from the WRF-GFS (below) indicates no precipitation at all in Arizona through midnight. The new NAM forecast indicates the same. So, the main weather question for the day is whether or not TUS will have a high temperature back into the 100s. Hurricane Hilary was upgraded to a Cat 4 hurricane yesterday afternoon. Satellite images at 1415 UTC this morning are shown - visible above and IR below. 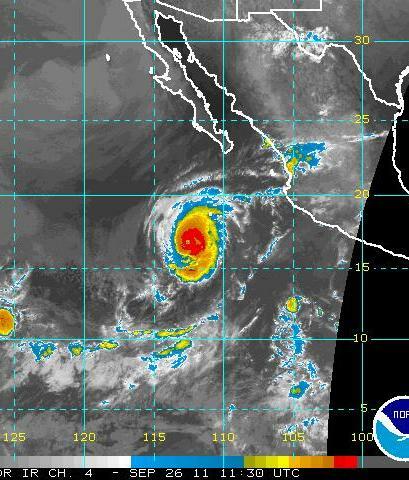 The storm is very impressive and appears to an annular hurricane - I think the third of the eastern Pacific season. Widespread convection continues to the west of Hilary but to this time does not appear to be affecting the hurricane. The forecast tracks are trending toward the north with time - so definitely a storm to keep an eye on. 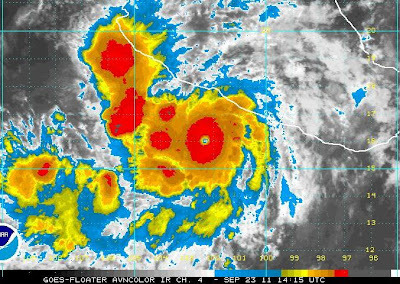 The disturbance mentioned a couple of posts ago is now Hurricane Hilary, which is forecast to become the fourth major hurricane in the eastern Pacific this season. Above is the current forecast for Hilary - which is very similar to the track followed by Hurricane Greg. This track is marginal for initiating a surge of moisture up the GoC. However, there is substantial variance among various model forecasts, so we'll have to keep close watch on Hilary. The above two images are from 1515 UTC and show the visual and IR depictions of Hilary. Of great interest is the large and intense MCS that is currently west-northwest of Hilary. It is unclear how the two features will interact today. Yesterday turned out to be quite interesting. Middle-level moisture and a bit of CAPE drifted in along the 500 mb short-wave trough/shear zone that's been west of Baja for several days. This led to some thunder, mammatus, and virga sprinkles. The hot, deep boundary layer below cloud base produced some dry microbursts. Ft. Huachuca had thunder, gusts to 37 mph and a trace of rain. Mt. Lemmon had 0.08" of rain. About 3:30 pm MST I was driving east on Ft. Lowell and passed St. Demetrios Greek Orthodox Church just as a microburst, with gusts to about 40 mph and clouds of dust, struck. It caused some chaos as they were setting up for their 36th Annual Greek Festival, which starts this evening - btw, highly recommended if one can tolerate massive crowds. Above is last evening's Tucson sounding, which hints at a bit of CAPE around 500 mb. However, the last two 0000 UTC soundings have been way too dry, so it's a bit hard to assess exactly how much CAPE there was (certainly more than the sounding indicated since there were some thunderstorms around). A time-series of GPS PW versus the Tucson sounding PW is shown below - note that last two days the afternoon sounding measured almost 0.25" less than did GPS. This morning's Tucson sounding has a bit more PW and hints at a bit more CAPE today. Both the Atmo early run of WRF-GFS and the morning NAM forecast isolated showers in southeast Arizona again today. Image below is looking south from Kitt Peak a bit after 7 am this morning, showing early morning buildups and light showers drifting around. The GFS operational member is picking up the disturbance currently south of Mexico - see previous post. The 195-hour forecast of 850 mb wind, heights, and PW is shown above. The GFS forecasts a TS to be near the south end of Baja, with a nice surge of mT moisture heading up GoC ahead of it. Of course 8 days is a long way out, and we'll watch how things develop over next few days. 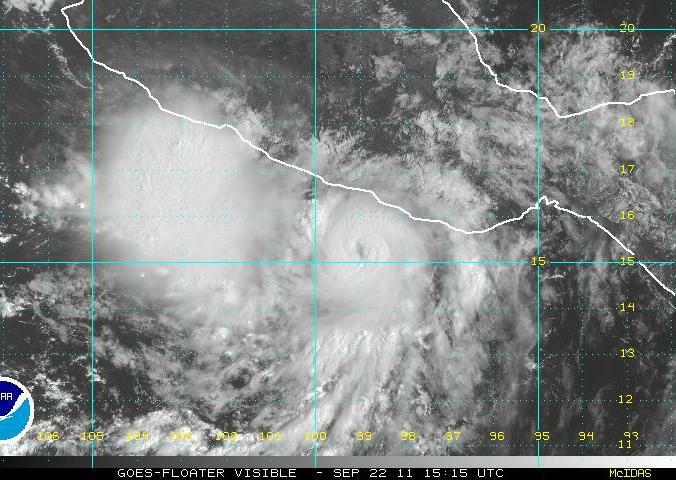 The last named tropical storm in the eastern Pacific was Hurricane Greg - 16 through 19 August. The month since Greg has been quiet, with the tropical action occurring in the Atlantic Basin. Today's outlook from NHC indicates a moderate chance for a disturbed area off the far southwestern coast of Mexico to develop - see above. 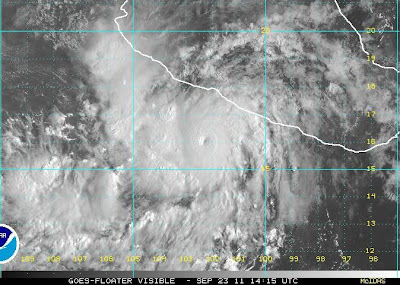 The area of interest is captured in the visible image above, which shows the disturbance to be centered around longitude 95 W, south of Mexico. Will be interesting to observe whether the Pacific becomes active again. The last eastern Pacific storm of 2010 was Georgette (September 20-23, 2010) - which formed south of Cabo San Lucas and moved northward up the southern half of the GoC - her remnants brought some rain to southeastern Arizona. 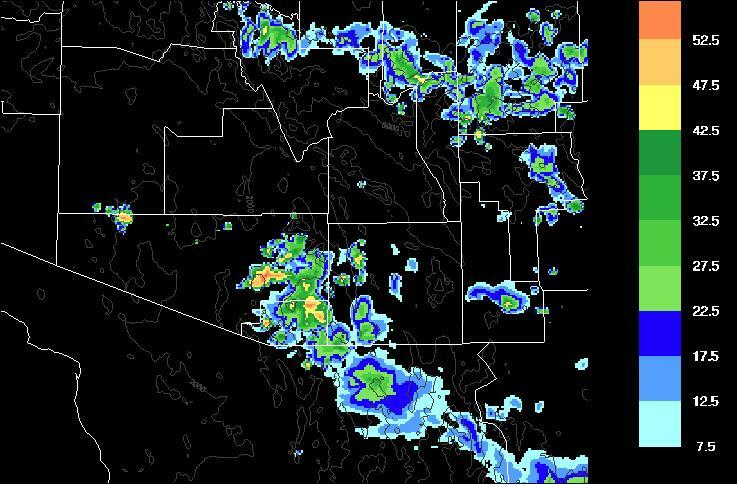 When Did The "Monsoon" End Over Southern Arizona? It is fairly obvious that the "monsoon" season has ended across southern Arizona, but when exactly did the synoptic pattern change? I've gone back and examined the upper-air charts and the Tucson soundings to address this question. To me, it appears that the "monsoon" season ended around 5 September. 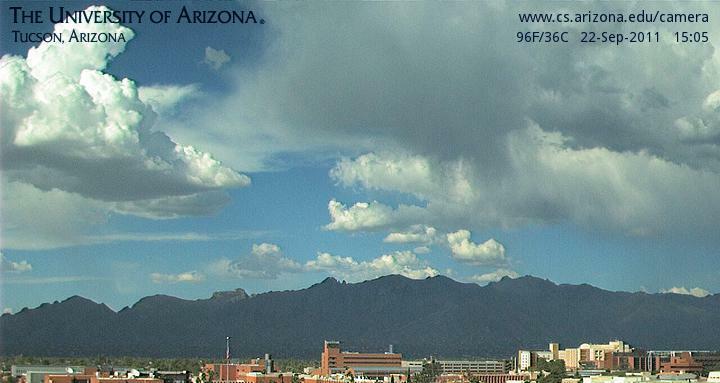 Another question is: What signifies the end of the "monsoon?" From my perspective, the end occurs when the subtropical anticyclone at 500 mb mb retreats southward so that it is no longer over, north, or east of Arizona - and remains so for an extended period (that is, a change that is not a transient shift of a couple of days). Admittedly, a messy definition, but one that is based upon the synoptic circulation patterns, rather than Td or PW thresholds. The morning Tucson sounding on the 6th of September (above) shows deep, westerly flow prevailing though most of the troposphere - a situation which has continued through this weekend (i.e., for 13 consecutive days). The concurrent 500 mb chart (above) on the 6th indicates the center of the anticyclone was over northeastern Sonora. The center of the anticyclone has continued to remain over northern Mexico (or far south Texas, or west of Baja) ever since the morning of the 6th. Thus, a significant change in the synoptic pattern occurred. However, moisture values (see the above 14 day times series of PW) have gradually diminished. This is often the case, since residual mT air can linger over the deserts. Additionally, the diurnal circulations over northern Mexico and southern Arizona can result in moisture sloshing back and forth, as long as the mT air remains over the northern GoC. There was an active period of storms from the 9th to the 15th - these were transitional storms in the westerlies that were feed by the instability (CAPE) resulting from residual moisture (PW values around 30 mm) and cool (-10C) middle-level temperatures. This situation is also not unusual, since the transition to Fall can produce conditions in Arizona that are similar to the Plains' severe thunderstorm environment. Photo above is of flooded streets yesterday (Thursday 15 September 2011) in the airport area. A large storm developed slightly west of the airport just after noon and essentially stayed locked over nearly the same area for two hours as new cells developed on the west flank of the original storm (classic training echo system). The event was intense, but also highly localized. 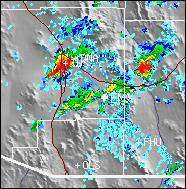 The airport received 2.84" of rain and Davis-Monthan AFB recorded 1.94"; however, the Atmospheric Science Dept. received only 0.04" and here at the house we had thunder, a strong cool outflow, and only 0.01". 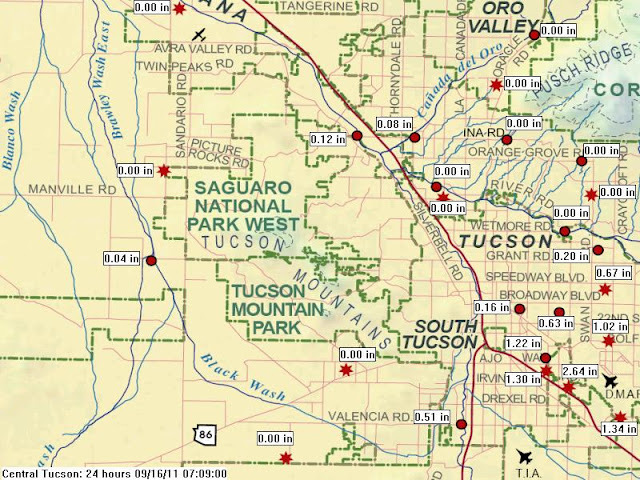 The map above shows a section of the Pima County ALERT network. The airport and DM are indicated by the airplanes in lower right portion of the map. Across the ALERT network 61 of 93 stations had rainfall during past 24-hours, but the heaviest amounts were clustered near the airport. Five sites had more than an inch, and all are shown on above figure. The two radar plots above are for 1:03 pm and 1:59 pm MST. The "+" sign within the fork of the interstates is TUS. The Catalinas and Rincons had very little rain yesterday, but the heavier rains extended east-northeast from the airport, across Reddington Pass (i.e., between the two mountain ranges). The runoff from the storm quickly brought the Santa Cruz River up to a flow over 10,000 cfs (from zero) and one person was apparently swept away. An interesting aspect of the September storms - the airport (TUS) has had 5.57" of rain, making this the wettest September on record there. However, only a bit more than 10 miles to the north, we have had only 2.08" of rain this month. Quite a gradient. As for today, conditions are more stable and the models bring drier, Pacific air across all of southern Arizona during the coming 24-hours. 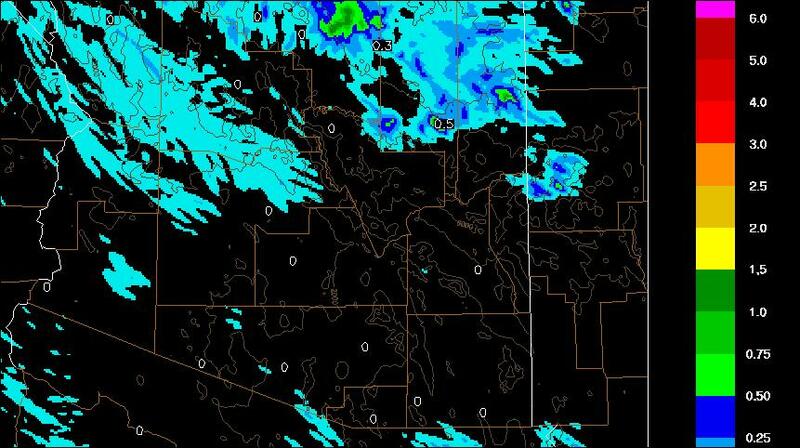 Both the WRF-GFS and NAM forecast only isolated showers for southeast Arizona this afternoon. First, a bit of a precipitation update - the ALERT network came back online at midmorning yesterday. 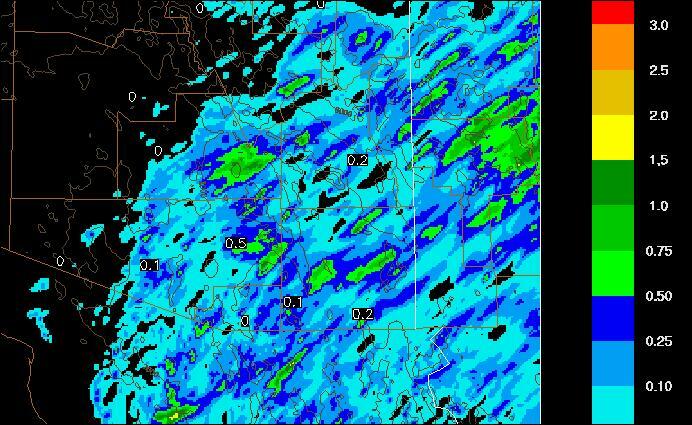 For the previous 24-hours 98% of the sites had rainfall and 15 sites had more than half an inch. So, a widespread event on Tuesday. This morning only 53% of the ALERT stations had rainfall in past 24-hours, so coverage was down substantially yesterday. Fives sites had more than half an inch and one site had more than 2 inches - these were mostly along the east edge of the network. There were a number of quite strong storms and several reports of severe scattered around. Here at house we had anvils and could see lightning at dark, but no thunder and no rain. This morning's Tucson sounding (above) is quite unstable, even though there is very dry air above 600 mb. Middle level temperatures remain cold, and the 500 mb trough axis remains to the west. The sounding is a bit too moist wrt GPS PW - so not quite as unstable as it appears. Winds and vertical wind shear remain very impressive for here. The morning hodograph is shown below and it even indicates some potential for supercells - if storms develop. 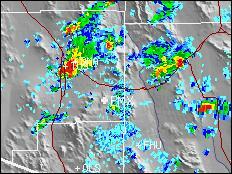 The Atmo early run of the WRF-GFS forecasts storms this afternoon from central Pima County eastward. 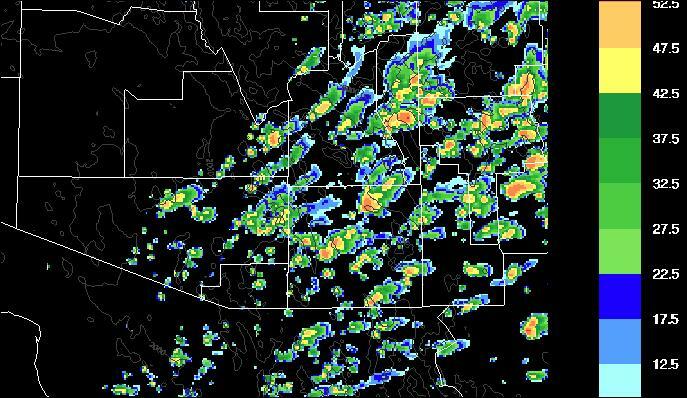 The composite radar echo forecast for 2 pm MST is shown below. The above graphic shows total rainfall forecast by WRF-GFS through midnight tonight. 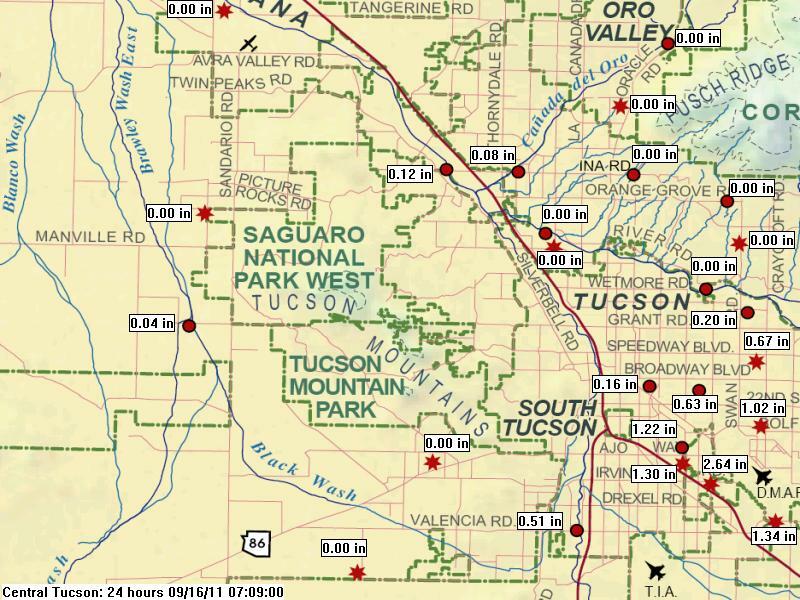 The model forecasts a good rain event for the Tucson metro area. The new NAM forecasts from 1200 UTC this morning are similar to the WRF-GFS. There is an uncertainty though that makes the forecast difficult. The WRF-GFS continues to show dry, low-level air invading southern parts of the state tomorrow. This dry air comes in from the south and southwest and without a Guaymas sounding the actual situation to the south of the border is somewhat uncertain. The satellite PW products seem to indicate that PW will stay at around an inch or a bit more today. Additionally, the strong shear in the dry air aloft will be hostile to developing towers. So, a mixed bag of pros and cons this morning. What's In Store For First Day Of September?